Do you get prospects that are stuck at one of the final stages of the sales process. They will not give you that final agreement to a sale? Or, they keep putting off one of the final stages but don’t give you a real reason why? Take a look at this technique and see if it you could use it to give your stuck prospects that little nudge to get them moving again. Some time ago we talked about a sales technique that’s used when you are struggling to close the deal, or when the sale is completely lost and you have nothing left to lose. It works by getting a second person involved, usually a sales manager, to have another go at selling to the prospect. The sales technique originated in direct selling and then made its way into car sales, time-share selling, and many other market places. Some people think it is unethical, or a sales trick that isn’t completely honest with the prospect. My opinion: It all depends how you use it. If you use it as part of your regular sales process, and you misinform the prospect in your initial sales pitch, then yes it could be seen as unethical and something of a sales scam. A fialed sales pitch is followed by a call from a sales manager. The manager starts by asking about the way the sales person conducted themselves, where they courteous, what did they say about the product. The conversation moves into another sales pitch and usually offers a much reduced price if the customer agrees the sale today. They can also criticise the first saes person to get onside with the customer against the seller. The price may reduce by more than fifty percent of the first price pitched to the buyer. This is a second bite of the cherry for the sellers and often catches the prospect while their defences are down and their resistance is low. Is there a way that a sales organisation that wants to be seen as professional and ethical can use this sales technique. Recently my sales teams have been using a version of this technique to try and close the sale with buyers that are holding off on making a decision to buy. The results so far are looking very good. In our service industry sales market place we have found that many buyers are holding back on signing contracts, even when they have no objections and appear to like the deals we are offering them. Do we hassle the buyer for a decision and risk losing the deal altogether. Or, do we wait and hope the buyer will sign. Too much pressure and we lose the deal, too little and we could still lose the deal. This is whem the sales technique of a second sales person calling the prospect is used. A manager, or a senior sales person calls the buyer. The conversation is both a customer service call and an attempt to move the deal to the next stage of the sales process. The caller asks about the meeting with our sales person. They are trying to discover how the meeting went from the buyer’s perspective. It may be different from the sales person’s version and maybe there is something stopping the sale. When a true picture is gathered the manager can look for what is stopping the sale and deal with it in the same way they handle sales objections when they are with a buyer. No tricks, no reducing price below what the sales person could have sold at, and the image of the company is not only maintained but could have been improved. Follow these steps to use this sales technique to close more of your sales. List the sales prospects that you have that are stuck in the final few stages of the sales process. Which ones need that extra push, will benefit from a second person contact, or you think there is nothing to lose by contacting. Decide who you will work with to call your stuck prospects. Will it be your sales manager, a colleague, or are you the manager and will use this sales technique with your team. You need a script for a great introduction to the call. The key part of your call is the reason you are calling. It has to sound, to the prospect, as a customer service type call and put them at ease. If the introduction sounds like a sales pitch you will not get the results you want. Note which type of prospects, stuck at which stage of the sale, you get the best results from phoning. Then use this technique even more on future prospects. Look at where it didn’t work and make changes to your calls. Think of this sales technique as just another situation that you are in where you are overcoming sales objections. 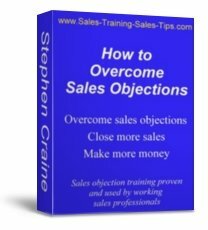 As sales people we are used to overcoming sales objections all the time. The one that holds off on giving you a decision. And those that just will not take that final step in the process. These should all be seen as sales objections and dalt with using an objection process. Once you get into the call and start trying to discover the reasons why they are not letting you close the sale, you can put your objection handling process into action. If you don’t have an objection handling process, or you want to improve on the one you have, take a look at the 4 step objection process that my sales teams use.